← When is the right time to invest in a CRM STRATEGY? 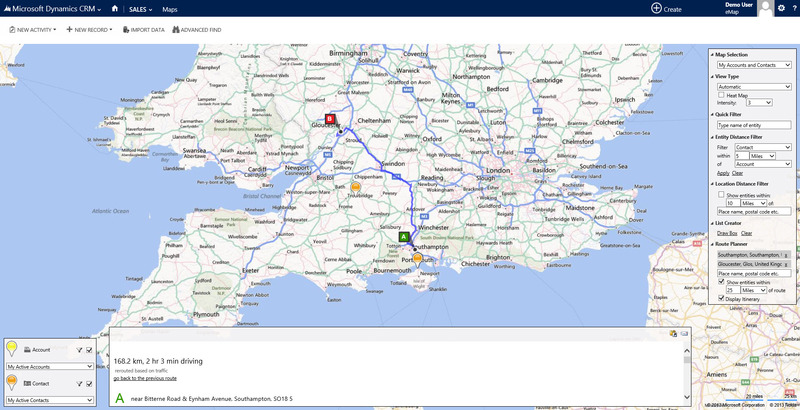 In this post I look at how you can use the same Map integration with Bing Maps and Microsoft CRM to plan routes and see customers on route, which is a great time saver for sales people that work in the field. This use of Maps gives great data visualisation of exactly where contacts and customers are in relation to each other, giving the ability to plan routes. 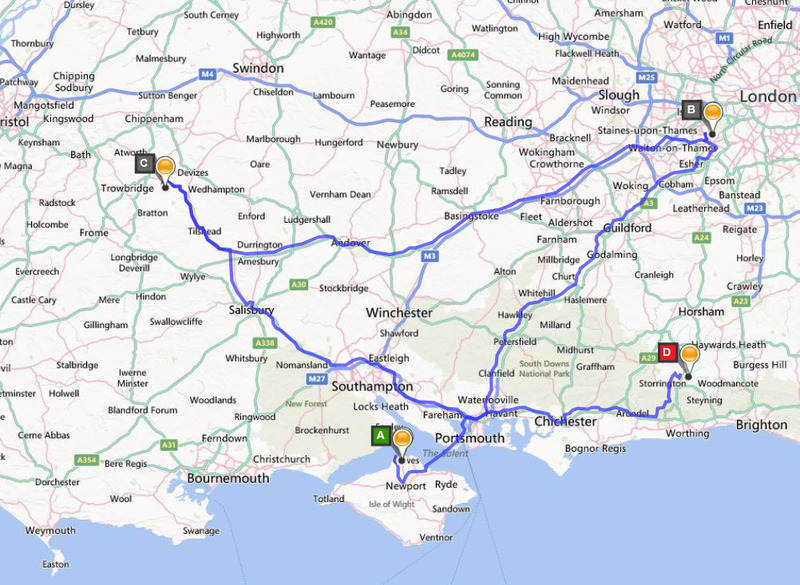 Map integration used in this way with CRM data can help sales people plan routes and spend less time on the road, helping increase productivity and reduce time and travel cost. The image below shows a simple route plan for 4 contacts that I plan on visiting, but you can also use it for other functions included in the solution. One of the advantages of having Map integration in your Dynamics CRM is that you can use the map server to Geo encode all your data and this allows the pins to be placed on the map based on current address data. Once this is done you can not only plan routes for your sales team but see active cases for engineers and see opportunities by area and value. Another great feature is the ability to show customers on route so instead of planning a route customer by customer you can add several points of interest and see customers that are within a specified distance of your main route points. This will also give you driving instructions as the points are identified on the map. Adding eMap to you Microsoft Dynamics CRM is a business win for all departments and only enhances use of the system and ability to visualise customer data. Tags : #Bing, #BingMaps, #CRM2011, #CRM2013, #MSDYNCRM, Add-ons, apps, Appstore, Attachment, Better CRM, Bing, Business, Business Development, Business Growth, Business Processes, Business Solution, CRM, Cloud Systems, Cloud CRM, CRM MAP, CRM Partner, CRM Provider, CRM search, CRM workflow, Dynamics, Facebook, GEO, GIS, G-Cloud iii, marketing list, Microsoft Dynamics, MyCRM Downloads, MyCRM, SME, Social CRM, surface, What CRM Systems, "Bing Map Extension for Microsoft CRM"